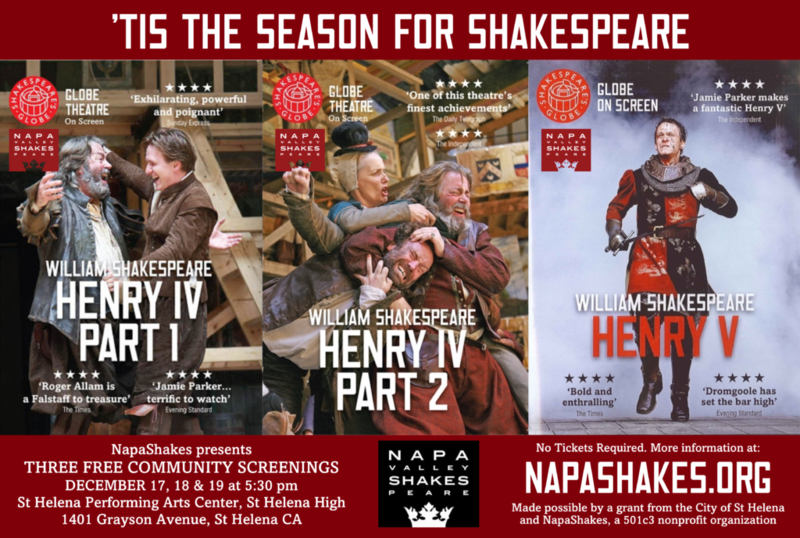 NapaShakes is delighted to present “Tis the Season for Shakespeare,”a free film series for the community featuring three acclaimed back-to-back Shakespeare Globe Theatre productions. The screenings will take place at the Performing Arts Center in St. Helena, at St Helena High School,at 5:30 pm on December 17th, 18thand 19th. This series is made possible by funding provided by the City of St Helena and by NapaShakes, a St Helena-based nonprofit. These screenings continue the partnership between the Shakespeare’s Globe of London, and NapaShakes, which has presented the Globe Theatre live on stage in performance twice, as well as multiple sold-out seasons of Globe on Screenat the Cameo Cinema. This free screening series is part of NapaShakes’ education program led by education director Laila Aghaie, with dramaturg Philippa Kelly, and follows a series of presentations by NapaShakes of Globe on Screen in local schools. These three screenings are free to the public and will take place at the St Helena Performing Arts Center at St Helena High School, 1401 Grayson Ave., St Helena. No tickets or reservations are required. The first installment of what is widely acknowledged to be Shakespeare’s greatest historical saga, King Henry IV Part 1 is an epic tale of power, treachery and war, exploring the complexity of father-son relationships. 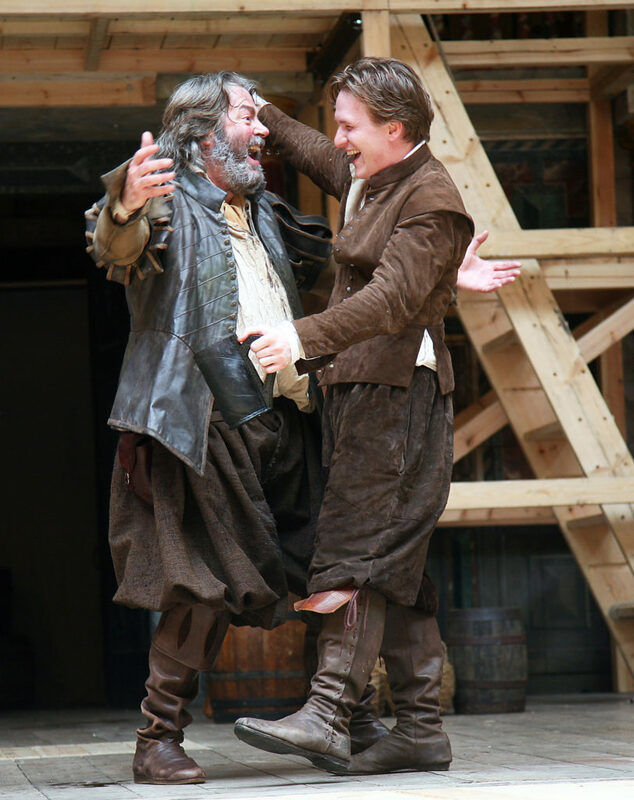 Featuring an Olivier Award-winning performance from Roger Allam as Falstaff, the comical mentor to Jamie Parker’s prince Hal, this celebrated and authentic production – expertly directed by Dominic Dromgoole – presents this classic play in all its glory. Dominic Dromgoole’s acclaimed production is brought to its conclusion in Part 2 of Shakespeare’s historical masterpiece, King Henry IV – a dramatic tale of family, treachery and war that surveys the entire panorama of English life. Staged with ‘terrific aplomb’ (The Daily Telegraph) and featuring a stellar line-up of actors, this magnificent Globe Theatre performance showcases some of the playwright’s most famous dramatic moments and confirms why King Henry IV is one of Shakespeare’s most highly regarded works. Henry V on Wednesday, December 19 at 5:30 PM. “We few, we happy few, we band of brothers…”Shakespeare’s masterpiece of the turbulence of war and the arts of peace tells the romantic story of Henry’s campaign to recapture the English possessions in France. But the ambitions of this charismatic king are challenged by a host of vivid characters caught up in the real horrors of war. With comic sub-plots involving Henry’s soldiers, the production boasts a popular performance by Sam Coxas Pistol and a spellbinding turn by Jamie Parker, who completes his transformation from Prince Hal to the charismatic leader Henry V.
Prince Hal, son of Henry IV, seems to be squandering his life among the whores, boozers and petty rogues of Eastcheap. And the greatest of these rogues is the fat knight, Sir John Falstaff, a liar, glutton, lecher, cheat, braggart, fool and sponger who also possesses wit, warmth, intelligence and a gigantic sense of fun. But beside these scenes of glorious misrule gathers a nationwide rebellion led by the Duke of Northumberland and his charismatic son, Hotspur. 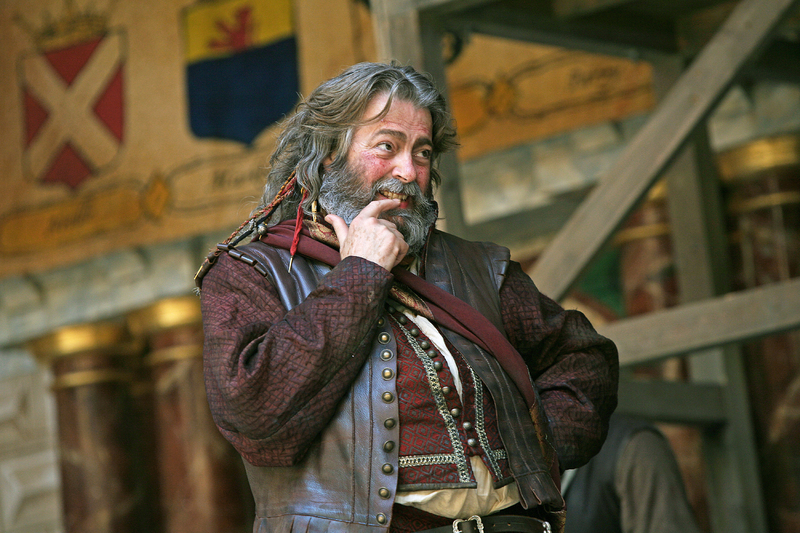 Roger Allam as Falstaff in Shakespeare’s Globe’s production of Henry IV Part 2 Photo: John Haynes. Hotspur is dead and Prince Hal has proved his mettle on the battlefield, but Henry IV lies dying and the rebels, though scattered, show no sign of declaring their allegiance to the Crown. Henry V’s father Bolingbroke (Henry IV) was never able to rule comfortably because he had usurped Richard II. 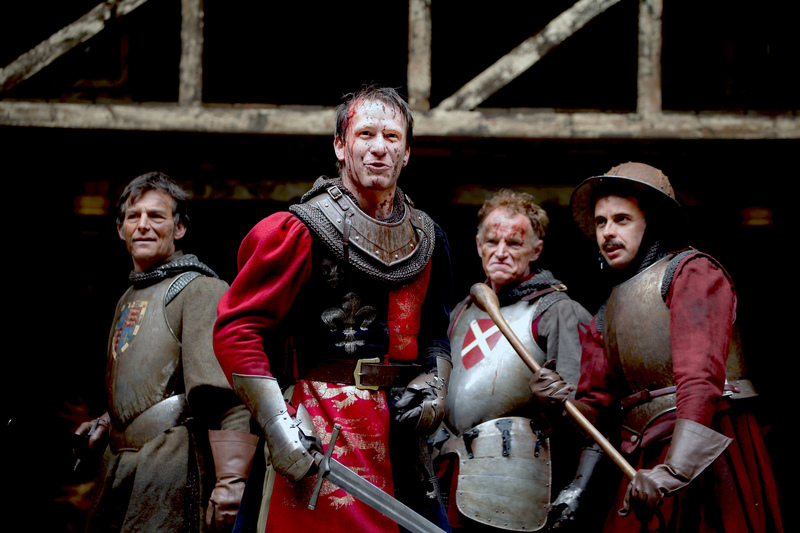 On his succession King Henry V is determined to prove his right to rule, including over France.